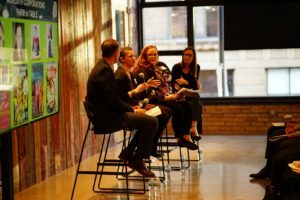 It was standing room only for the North Central chapter’s October event focused upon “Meet Your New Boss.” The North Central chapter hosted a panel discussion in partnership with Meredith Corporation at broadhead’s 401North event space. The concept was focused around how consumers are shaping and influencing how we purchase, buy, interact and think about our food consumption. How are millennials and Gen X impacting our thoughts on food and agriculture as a whole in the future? Is the consumer “your new boss” in agriculture? 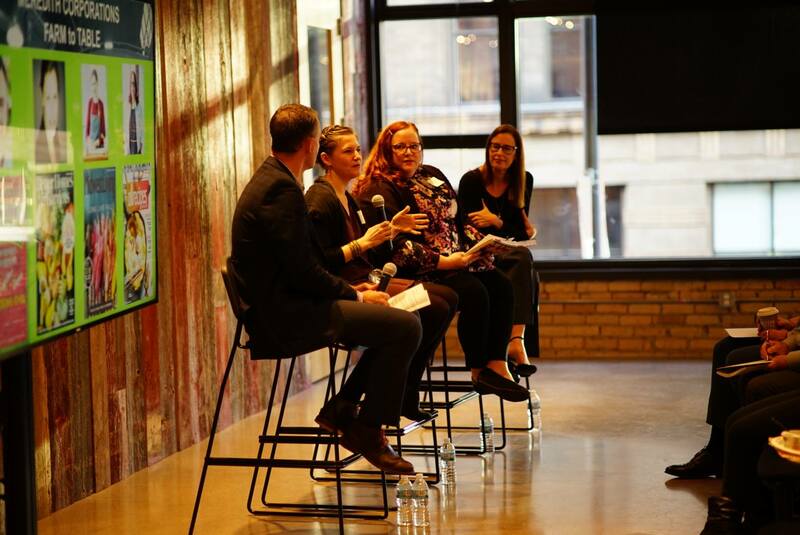 The panel discussions consisted of three food editors from Meredith Corporation’s food titles: Jan Miller–Better Homes and Gardens, Executive Food Editor; Hannah Agran–Midwest Living. Food Editor; and Nicole Aksamit—AllRecipes, Food Editor. The panel discussion was moderated by Successful Farming’s Content Director, Dave Kurns. 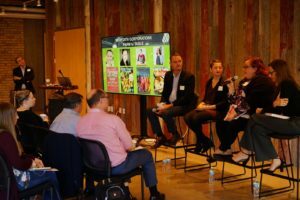 The panel discussion helped the NAMA members and guests grasp a better understanding how each of the food editors’ audiences think, interact, purchase and cook with food. The discussion focused upon how we can work together to bring a message to both audiences on agriculture and food? Let’s continue to have more conversations “together” like this on the future of food. Have a Presentation You’d Like to Share? NAMA is providing an opportunity for you to share a presentation with the NAMA community via webinar. Webinar topics must be both cutting edge and of current interest. Case studies showcasing strategies and results are also popular with members. In addition to the opportunity to engage our community, webinar presenters receive recognition through pre- and post-promotion via the NAMA website, e-News and social media feeds. If you’re interested in learning more, follow this link for additional information. But don’t let too much time go by; the deadline to submit is November 15. Presentations submitted are in consideration for the 2019 calendar year. Join Midsouth NAMA on Thursday, October 25th at 4:00 p.m. at Tom’s Farm. Tom will share his production and marketing approach, and after the group can participate in the eight acre corn maze and pick a pumpkin from the pumpkin patch for free. Tom’s Farm is located in Rossville, just east of Collierville, and have served thousands in the area as a family favorite destination. They offer a corn maze, wagon rides, pumpkin patch, bonfires and fall decor. So bring a friend or your family to join in the fun!